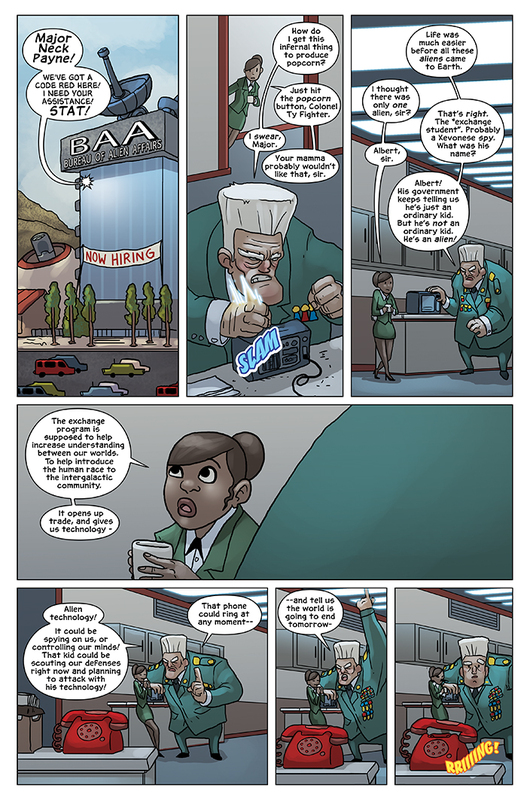 In today’s Albert the Alien, we’re introduced to several new characters working for the B.A.A – the Bureau for Alien Affairs. Lead by Col Ty Fighter. His dialogue exchange with his associate, Major Neck Payne, was something I wanted to play out very comically. Col Ty is very over-the-top, very prone to excitement and over-reacting. Maj Payne is much more grounded, more in control, and ultimately a better leader. This goes to show you that, while not necessarily a bad guy, sometimes jumping to conclusions before you assess situations can make you appear like a villain. And we’ll see that play out throughout this chapter of Albert. Again, hopefully in a comical way. As for these two characters and the B.A.A in general, we’ll be seeing them pop back up from time to time throughout Albert’s adventures on Earth. But for now, what could that ringing red phone mean? We’ll find out next week!